Is This Really Just a Popular Trendy Diet? 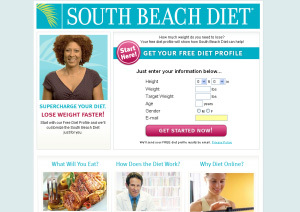 The South Beach Diet has become a worldwide diet phenomenon. Since its publication in 2003, the South Beach Diet has been on the New York Times best seller list for a remarkable 69 weeks. More than 22 million copies of the South Beach Diet and its companion books have been printed worldwide. Since the diet continues to increase in popularity worldwide as a result of its proven effectiveness for weight loss and better health, the South Beach Diet has been made more accessible online for more people to learn and use. The South Beach Diet and its online weight loss diet program was developed by Dr. Arthur Agatston, director of the Mount Sinai Cardiac Prevention Center in Miami, Florida. With a diet that bears the name of a famous and glamorous beach in Miami, is the South Beach Diet just another highly publicized fad diet or is it a diet program worth seriously considering to achieve your weight loss goals and long-term overall good health? Dr. Agatston's initial goal was to develop an eating plan that would improve the cholesterol and insulin levels of his heart patients. As it turned out, the plan was not only effective in improving cholesterol and insulin levels but also proved to be very effective in inducing weight loss among those who went through the program. 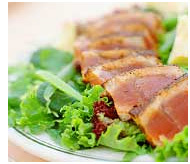 In a nutshell, the South Beach Diet is not about just having low fat or low carb meals. The South Beach Diet is more about eating the right carbs and the right fats to help induce weight loss. Combine this principle with great tasting, well-balanced meals that Dr. Agatston promotes and an active lifestyle, you have a super formula for weight loss. > Phase 1: This phase is about banishing your cravings. For the first 14-days, you'll eat normal-size helpings of meat, chicken, turkey, fish, and shellfish. You'll have plenty of vegetables, eggs, cheese, and nuts. You'll have salads with real olive oil in the dressing. During this phase, you can't have any bread, rice, potatoes, pasta, or baked goods ... not even fruits. No candy, cake, cookies, ice cream, or sugar. No beer or alcohol of any kind. > Phase 2: This phase is about reintroducing carbs. As you continue to lose weight from the Phase 1 process, Phase 2 allows you to bring back some of the food that you but in a more controlled manner. You will have to pick and choose some indulgences. You'll learn to enjoy them a little differently than before because of ongoing changes in your eating habits. You remain in Phase 2 and continue losing weight until you reach your goal. Once you hit your weight goal, you will then switch to an even more liberal version of the program, which will help you to maintain your ideal weight. > Phase 3: This stage of the South Beach Diet is about maintenance. How long does this last? This stage is for the rest of your life. By then, this is more of a way of life rather than just a diet. By this point, all you have to do is to stick to the basic rules of the South Beach Diet and enjoy your new way of life. Another major difference between the South Beach Diet and other weight loss programs in the market is that with the South Beach Diet, dieters choose food with low glycemic index numbers and are allowed to eat generous portions. For those who are not familiar with what a glycemic index is, this is an index that rates food which contains carbohydrates on how quickly they are digested and how they affect our blood sugar levels. Below are some of the reasons why the South Beach Diet has become a very popular program among people who are trying to lose weight. Clinically proven to be effective. The South Beach Diet is a clinically proven program that will help you lose weight and achieve a better overall state of health. Backed by sound research, the South Beach Diet encourages the whole grains, vegetables, and fish, which contains adequate amounts of mono- and polyunsaturated fats and omega-3 fatty acids. The South Beach Diet discourages refined processed foods such as refined flours and sugars, meats and processed meat that are high in fat, and saturated fats in general. > In 2007, a study published in the Journal of Nutrition found that 12 weeks on the South Beach Diet resulted in improvements in weight and health for 20 participants who were overweight and who exhibited all the criteria for metabolic syndrome (a condition marked by a cluster of symptoms, including high blood pressure, abdominal obesity, and poor blood chemistry) when the study began. (see study here). > In 2005, a third party study reported that participants who followed the principles of the South Beach Diet lost twice as much weight as those following a portion-controlled, low-fat plan, and also showed greater losses in body fat. In addition, they experienced significant reductions in triglycerides and their ratio of total/HDL cholesterol (see study here). > In 2004, Dr. Agatston and his colleagues published a paper in the Archives of Internal Medicine and reported that subjects on the South Beach Diet lost twice as much weight as those following the National Cholesterol Education Program low-fat diet (see study here). Variety of meals and food options to choose from. Phase 1 of the South Beach Diet is when you undoubtedly feel that you are on a weight loss diet program. Once you get over this 14-day period, you will have a sense of normalcy in your meals and less craving for food that made you overweight. The various South Beach Diet recipes available gives you a lot of options to choose from for preparing your hearty meals. A lot of people who have used this program to lose weight swear by the variety of meals and food available for the diet. With the South Beach Diet, you'll be having dishes such as grilled chicken salad, spicy seared tuna, grilled steak, roasted chicken, vegetables, and fresh, Miami-style salads. You will also be having dessert, snacks (twice a day), and some fast food options. You will never have a feeling of deprivation once you know what to eat and store in your refrigerator and pantry. Actual testimonials of people who have lost weight. You will find countless numbers of testimonials of people who found weight loss success with the South Beach Diet. 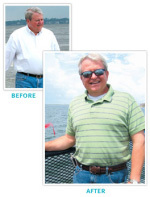 South Beach Diet provides testimonials of men and women who highly recommend this diet. We did additional research on the Internet and found a lot of people providing feedback and testimonials about their South Beach Diet success experience, including actual before and after pictures. Actual testimonials are not tough to find about how the South Beach Diet has changed the lives of many people around the world. Easy to follow diet program. Overall, the South Beach Diet program provides a sound and effective weight loss plan. Phase 1 of the South Beach Diet program may be a "shock" to your system due to the stringent limits on what you are allowed to eat. This phase is just for 14 days and is meant to purge your cravings of food that made you overweight in the first place. Still, we find the South Beach Diet easy, practical, and very easy to follow. The South Beach Diet program does not require you to count calories nor limit your portions. Instead, the South Beach Diet suggests that you eat until you are satisfied. On a daily basis, you have six meals consisting of breakfast, lunch, dinner, and snack in between meals so you never become hungry and keep your body working like a calorie burning furnace. Complete and personalized diet planning. South Beach Diet Online will customize your plan and guide you through each of the three phases of the program. It all starts with you getting your diet profile, setting your goals, and food preferences and this tool will personalize your diet plan for you. 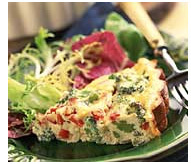 We found this South Beach Diet profile very interesting and fun to use. With the South Beach Diet profiler, you will realize certain aspects of your eating habits that you had never really thought about. The South Beach Diet profiler is a great tool for goal setting. This easy to use tool will guide you through the South Beach Diet program every step of the way. Access to 1,000+ recipes and food guide for each phase. 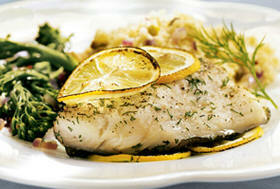 The South Beach Diet Online meal planner provides you daily meal plans which are customized based on your preferences. Furthermore, this tool gives you access to over 1,000 delicious and latest South Beach Diet recipes many of which are not found in the book as well as access to recipes from other South Beach dieters. Of course, these are all easily printable too. Online tools to guide you and keep you on track. A recent study published in the American Journal of Preventive Medicine found that tracking your progress can help you lose more weight. South Beach Diet allows you to chart your weight loss progress, keep a journal of the things you eat or your thoughts about your progress, read other people's journals to inspire or motivate you, and join the message boards to gain more support and get assistance for your questions. With South Beach Diet, you have 24-hour access to specially developed interactive tools to help you succeed with your weight loss goals. Supportive online community of 750,000+ ... you will never feel alone dieting. On South Beach Diet Online, you will find a vibrant community of more than 750,000 South Beach dieters (thousands of them) who are always more than willing to provide you support and motivation to reach your goals. You will never feel alone in your quest for weight loss and better health. You will also get to meet expert dietitians who answer questions everyday about any questions you have about South Beach Diet. Very affordable. Forbes.com awarded South Beach Diet Online the distinction of Best of the Web because of the site's ease of use and most of all, affordability. Considering the alternative diet programs that require you to buy their prepackaged food or meal replacements and can cost you at least $100 a week, South Beach Diet Online is very inexpensive. We think that this is a wise investment especially since you get the latest information on South Beach Diet, you get access to some of the best weight loss tools and guides we have seen so far in the market, and most importantly — access to Dr. Agatston and his team of nutritionists and dietitians. Note that this subscription is only for access to all the tools and information on South Beach Diet Online. You may cancel your subscription anytime or when you feel that you can manage on your own. Most South Beach Diet users highly recommend the use of the tools on the site as a way to motivate yourself, have the latest recipes and meal preparations, and connect with other South Beach dieters. Find a partner with the Beach Buddies program. With South Beach Diet Online's Beach Buddies program, you can pair up with other members of the community to motivate each other to achieve your goals. Based on feedback from people who used the Beach Buddies program, this was a great motivator especially during times when you are hitting some bumps in your progress. Having a partner to work out some issues that you are having or having someone there to give you the mental and psychological support you need can make a huge difference. Daily email newsletter. 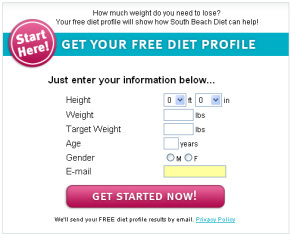 As a member of South Beach Diet community, you will exclusive subscription to the daily email newsletter. The South Beach Diet newsletter provides information on dieting secrets, new South Beach Diet recipes, updates to the diet, other health news, and the latest news directly from Dr. Agatston and his team of nutritionists. Access from anywhere. Regardless of where you live — in the US, in Europe, Asia, Australia, MIddle East, or Africa — you can access South Beach Diet Online 24 hours a day, seven days a week. This is the beauty of the South Beach Diet — there are no restrictions as to who may avail of this program. Whereas other weight loss diet programs have geographic limitations due to prepackaged food or meal replacement food delivery restrictions, since you prepare your own food with South Beach Diet, you can do this wherever you live. Phase 1 requires a lot of will power and discipline. South Beach Diet's 14-day Phase 1 might be of a system shock to some people. This phase of the South Beach Diet program is the most restrictive because a lot of the food cravings that you normally have should be totally avoided during this phase. During this phase, carb and sugar-lovers will require more will power to avoid the temptation to cheat and consume their habitual carb and sweet cravings. As one of our practicing South Beach Diet friends suggested, you just have to think of going through this phase one day at a time. Before you know it, the 14 days are over. After the first 14 days, everything becomes a lot easier. Besides, it's s well worth it since you end up losing weight during this phase, which is really very rewarding. Need to prepare your own food. If you are the type who prefers the convenience of having pre-packaged, pre-cooked diet meals or the convenience of having meal replacements, then this diet might not be for you. Although most South Beach Diet recipes are very easy and simple to prepare, there are those who do not like preparing food at all and find even simple recipes "complicated". Some people also think of preparing food a chore. Keep in mind that by preparing your own meals and doing the related grocery or supermarket shopping, you are also burning calories and doing some physical activity. This is therefore another opportunity for you to have some exercise, which is actually good for you. Must include regular exercise. Just like most effective weight loss programs, exercise is part of the success of the South Beach Diet program. In fact, having an active lifestyle is highly encouraged not only for losing weight but more so for overall health and physical well-being. For those people who are not fond of exercising, you might need to rewire your brains and get yourself into more physical activities or into a regular exercise regimen. Since this is for your overall physical well-being and health, you need to motivate yourself to get into the habit of planning and doing some physical activities that will give you a good sweat. Don't like paying subscription? There are some people who don't like paying subscription to a service, despite having access to all the tools and expertise to help them lose weight and achieve better health. If you do not like subscriptions, an alternative weight loss diet program that you might like to consider is Fat Loss 4 Idiots (Editor's Choice). This weight loss diet program has become an online diet phenomenon and charges only a one-time, very affordable fee. You might like to read our review of Fat Loss 4 Idiots to see if this is for you by clicking on this link: Fat Loss 4 Idiots. No face-to-face support group. Some people like to have face-to-face meetings with a support group or a weight loss counselor to keep themselves motivated. Although South Beach Diet does not offer this like the regular weight loss programs of Jenny Craig or Weight Watchers, you have a couple of options still. Join Online! Personalized diet solution: tools, tips, meals, & more. "Did We Lose Weight with South Beach Diet?" Note: Most South Beach Diet users have reported losing one to two pounds on average per week. Please be aware that results may vary depending on the individual and other factors. "I was dedicated to South Beach ... Today I am down 134 pounds at 283 in 10 1/2 months. Nearly 1/3 of my former heft is gone ..."
"I started the South Beach Diet as a New Year resolution in January of 2004 and followed it exactly. The weight started to melt off me (lost 80 pounds, from 230 to 160) ... "
"I have officially lost 40 pounds!!! I can't tell you how proud I am of the changes I have made in my life. I am eating so much better. I walk 5 days a week. What a difference. A life changing difference. If lazy and sweetaholic me can do this anyone can! " "This morning I weighed in at a mere 1/2 pound away from my goal. This means I've lost another 1.5 pounds this week--total of 14.5 pounds in 19 weeks (minus one day). " "... I've truly experienced that this diet can really change your life. I'll always be grateful that I discovered this way of eating and I know I'll never go back to my old eating habits again." "I found south beach pretty easy to stick to... I lost 16 lbs in the 2 first weeks I did it.. but it ALLLLLLLL came back! too hard to stick to long term for me. I would probably use some of the tips to jumpstart some loss... but it didn't work as a long term thing for me." "I am now committed to SB as a way of life ... It has been extremely effective for me, and I’m proud of my progress. I’ve lost more than 65 pounds and dropped SIX pants sizes and SEVEN dress sizes since starting SB ..."
"For those interested in the ups and downs of my South Beach Diet journey back in 2006 ... My Honey and I each lost 20 pounds in just over a month and managed to keep it off for 2 years." "The most important thing I can say is, thank God for Dr. Agatston and his diet! I had not been on a diet for 20 years ... My experience with South Beach Diet is nothing but amazing ... After 10 weeks using the South Beach Diet I have lost 44 lbs. ..."
"I have been eating the South Beach way for 9 months and have lost 30-35 pounds overall and am very near my final goals. (I am 5'11" and male and now weigh under 190 lbs.) I find it a fairly flexible eating program and a very healthy eating program that doesn't really focus so much on "low-carbs" as eating a balanced diet ... "
"My original goal was to lose 40 pounds in 40 weeks — and I did. That day I cried tears of joy." "I started the south beach diet sometime in late August. As of today, December 29, I have lost approximately 29 lbs. Here's the great thing -- I've technically been off the diet since October..."
"I lost 75lbs on SBD and maintained for about 6 months, then I got pregnant (so I guess it doesn't really count as not maintaining) ... back on the SB way of eating to lose the extra lbs from the pregnancy. " "My husband and I have been on the diet for 12 days and are very happy. i dropped from 132 to about 126 and he went from 175 to about 169..."
"... this morning I had "weigh-in" and lost another 2#!! My losses are 14# since I began the SB program! " "I just got my results and compared to a year earlier ... they were very good and improved. Total Cholesterol: Old 179...New 150 HDL: Old 50...New 58 LDL: Old 109...New 84 Triglycerides: Old 101...New 40 Glucose: Old 98...New 90 .... Anyway..for those looking to improve their bloodwork ... KEEP GOING!!!!" "I myself am disappointed in my weight loss in the first 14 days,P1. I've lost 2 lbs WK1, 1.5lbs WK2. I've been very strick on P1. What's going on???? ... "
"I had my lightbulb moment in January 2004. I was 280 pounds. I wore a size 2 or 3X (about a 24). I looked awful. I felt awful ... By my birthday in Sept of that year (9 months into my lifestyle change) I was down to 180 pounds and a size 14. 100 pounds gone. My resting heart rate used to be a scary 120. Now it's 65. My b/p went from 135/90 to 100/60. My cholesterol went from 250 to 170. I feel younger than when I was 25... "
"I went from bulging out of a size 42 waist to a sleek size 34." " I've officially lost 80 lbs on SBD!!!!!!! "I've had staggering results with blood work - my Dr. actually ordered me to go back and retest because he didn't believe it. 3 months on SB, lost 30 lbs. LDL: 205 -> 104 HDL: 35 -> 47 Triglycerides: 229 -> 104 My weight is actually where I want it ..."
"I lost 32 pounds on the South Beach Diet, and my daughter lost 30. The last three pairs of pants I bought were size 4. Last summer, my size 12 jeans were getting too tight! I haven't been this slim since my freshman year of college. ..."
"Well I just completed my first month and hit the scale today and I lost 20lbs. Dumping the white breads, pasta, desserts, fried stuff. Cool thing is I don't miss or crave any of that ..."
"Chris started the South Beach Diet in 08/03, and Maggie joined him in 10/03. 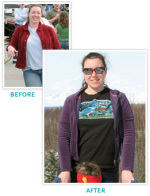 We have each dropped several sizes, dramatically improved our health, and reshaped our bodies. South Beach Diet isn't just a diet now, it is our way of life. We continue to live and eat the South Beach way. We expect to live a long, active and healthy life together! ..."
"Well, Saturday the 30th marked two years for me and my healthy life ... My weight loss over the past year has been in the 6-9 lb range, but I easily maintained the first 80 lb loss ..."
"I have continued to lose weight and am now less than 10 pounds from my final goal. I feel better than I have in years! Every day I am amazed at the energy I have and how much I'm enjoying life ..."
"I love South Beach! ... I am 5'7" and was 143 for the longest time and did South Beach to kick start my diet and was as low as 126 but shot back up to 134 in the past couple months. I'm down to 130 and have dreams to see 120-124 as my steady weight ..."
"My husband's whole family did it last summer with very fast results. My husband actully lost the whole thirteen in the first two weeks and I lost about 10 in those weeks. It was easy to follow because their is no worry about amounts of consumpution ..."
"Success! I put my husband on SB twelve weeks ago So far, my husband has lost around 25 lbs. and I have lost 16 lbs. I am maintaining and my husband continues to lose. At 5'9" he is just under 160 lbs, but nature does not seem to be done with him yet...still losing ... "
"This week I was to reach my first real goal of 20 pounds lost. I had been losing 1 pound per week. I started walking three weeks ago. 1 1/2 miles 5 days a week on my lunch hour. I guess it caught up with me because this week I lost 3 pounds blowing me past my first goal of 20 to 22 pounds." 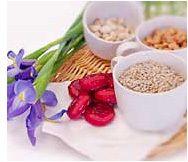 To continue reading more actual customer feedback on South Beach Diet, Click Here.